Mister Rogers arrives with photos of his wife, Joanne, and mentions that she will be performing a piano recital after today's television visit. He talks about waiting for something special and decides to pass some time by building with blocks. 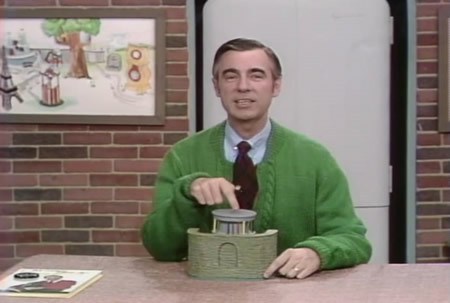 As he builds, Mister Rogers sings I Like To Take My Time. In the Neighborhood of Make-Believe, the Upside Down Amateur Hour airs on MGR-TV -- a program which offers some entertaining camera angles thanks to Lady Elaine's boomerang. Lady Elaine also interviews Mr. McFeely who talks about his hobby of collecting movie cameras and film projectors. He shares funny fast films of Chef Brockett baking, Lady Aberlin making a bed, and himself mowing the lawn. Back at the house, Mister Rogers uses the block street and cars he built earlier to talk about crossing the street safely. 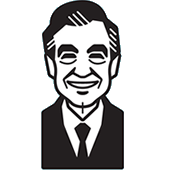 At Brockett's Bakery, Mister Rogers picks up sandwiches for his wife's upcoming recital. While he is there, he watches as Chef Brockett makes a salad. Returning to his house, Mister Rogers shows a film about Darren, a boy who has difficulty hearing but is still able to do things that other children do. The funny fast film of Chef Brockett also appears in Episode 1049. A similar (but different) funny fast film appears in Episode 1096. The funny fast film of Betty Aberlin also appears on Episode 1083 and Episode 1219. The funny fast film of Mr. McFeely also appears on Episode 1250 and Episode 1746. 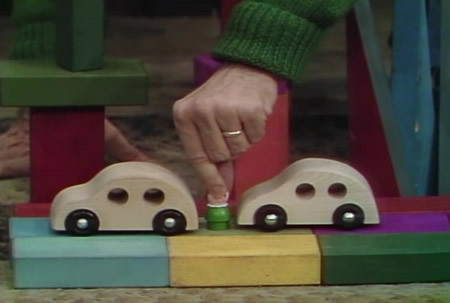 The figure used by Mister Rogers to teach about safely crossing the street is a piece from the Fisher Price Little People line of toys. On the kitchen table is a copy of the Mister Rogers Songbook. As Mister Rogers leaves for the day, Mrs. Rogers joins him to go to her recital. Mister Rogers shares: "It gives me a good feeling to know that I can be with her and grown-up friends now, and still know I'll be with you tomorrow."